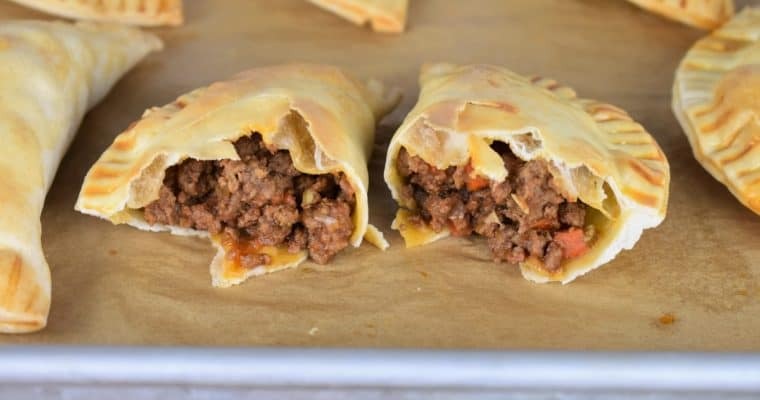 Serve the bistec a caballo with chopped onions and parsley, and ketchup, for a delicious Cuban meal. 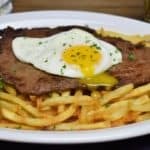 If you’re looking for more easy Cuban-style dinners, try this chicken steak (bistec de pollo) or a classic bistec empanizado. Enjoy! To have everything ready at the same time, I suggest you make the fries first (especially if cooking them in the oven). When the fries are almost ready, start the steaks. Leave the fried eggs for last. Make the Fries following package directions, fry or bake depending on taste. We use the oven to make the fries, they come out great. Just remember to sprinkle a little salt over them as soon as they come out of the oven. Add the salt, garlic powder, onion powder and black pepper to a small bowl, stir to combine. Season the steaks on both sides with the seasoning mix. Heat the oil in a large, skillet over medium-high heat. When the oil is hot add the steaks. Cook one or two steaks at a time, don’t overcrowd the pan. Cook about 2 minutes per side, depending on the thickness. The thin steaks will cook very quickly, brown them on each side and they should be cooked through. Remove the steak(s) from the skillet and place on a plate or pan and repeat with the remaining pieces. Add a little more oil to the skillet between batches, if needed. Keep the steaks warm by covering loosely with foil, and/or place them in the microwave to keep away from drafts. Add enough oil to cover the bottom of a non-stick skillet. Heat the oil over medium heat. Carefully crack the egg and open the shell over the hot oil. Cook the egg to desired doneness. Leave the yolk soft in the middle, if desired. Sprinkle with a little salt before serving. Divide the fries evenly among 4 plates. 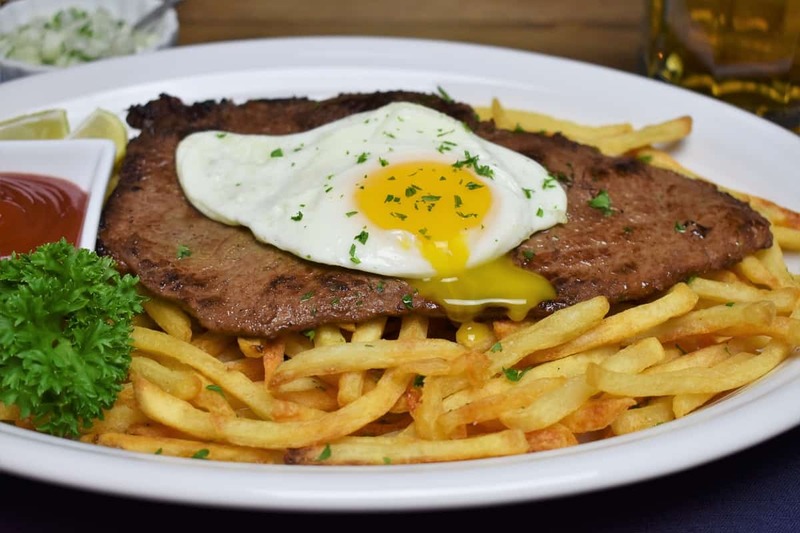 Place the steak on the fries and top each with a fried egg. 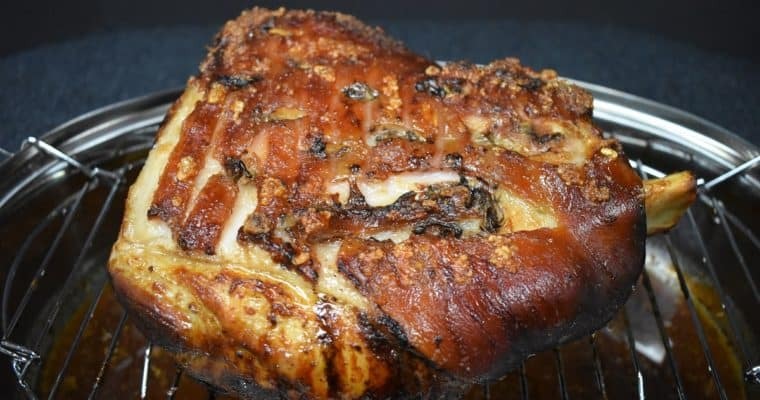 Serve with the onions, parsley and ketchup. Enjoy! 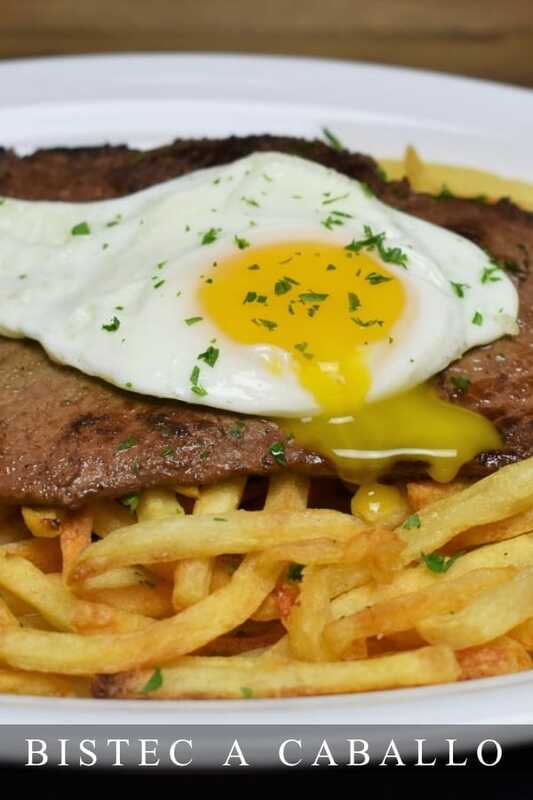 Bistec a Caballo is the Cuban equivalent to steak and eggs. Make the Fries following package directions, fry or bake depending on taste. Add the salt, garlic powder, onion powder and black pepper to a small bowl, stir to combine. Season the steaks on both sides with the seasoning mix.